Bucket list member gathering! Frank Lloyd Wright's winter home in Scottsdale is an attraction for all lovers of intriguing architecture paying homage to our natural desert landscape. Local First Arizona invites you to join us for starlight mixer filled with private tours for guests, local bites, and a unique experience you won't soon forget. Tours will be taken through the beautiful Garden Room, as well as Frank Lloyd Wright's private bedroom. Guests can enjoy starlight on the private Garden Room Lawn where refreshments will be served. See pictures below! Join us at our next member gathering at Pueblo Grande Museum in March! Click here for details and to sign up. Taliesin West is a National Historic Landmark nestled in the desert foothills of the McDowell Mountains in Scottsdale, AZ. 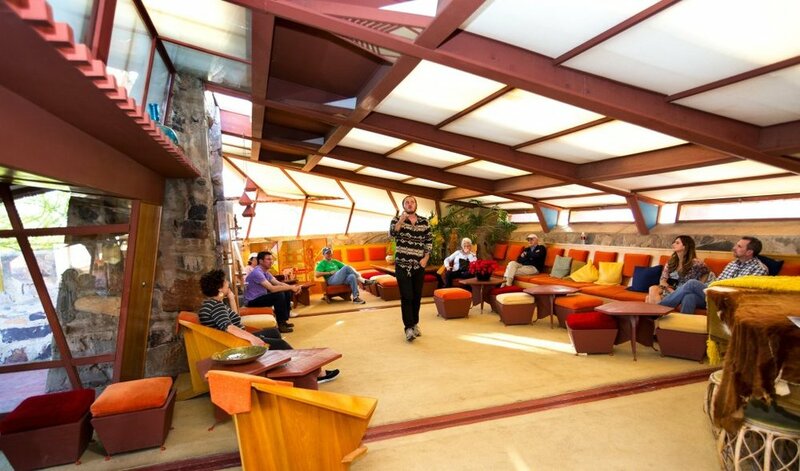 It is also the home of the Frank Lloyd Wright Foundation and the School of Architecture at Taliesin. Wright’s beloved winter home and the bustling headquarters of the Taliesin Fellowship, was established in 1937 and diligently handcrafted over many years into a world unto itself. Deeply connected to the desert from which it was forged, Taliesin West possesses an almost prehistoric grandeur. It was built and maintained almost entirely by Wright and his apprentices, making it among the most personal of the architect’s creations.